I’ve been a subscriber to various magazines over the years. 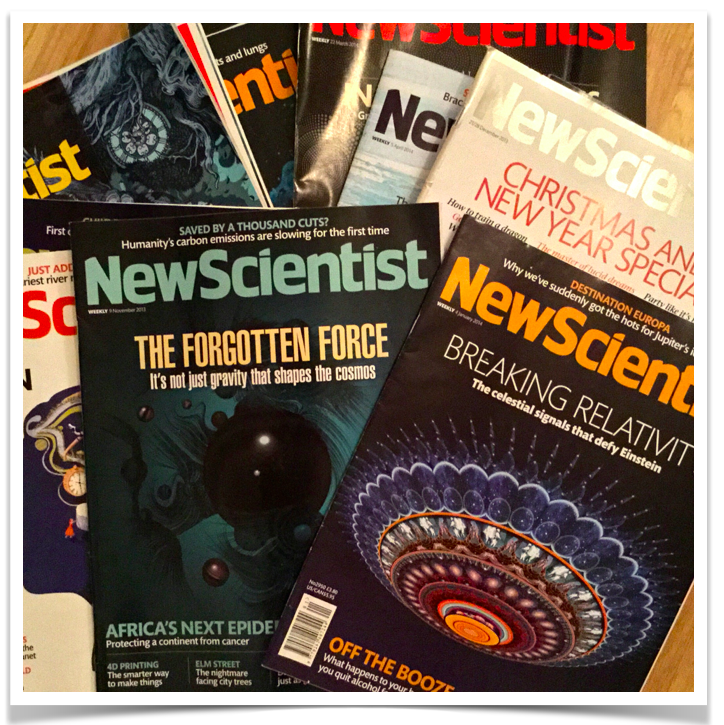 Since 2006 and to this day I’ve had a subscription to New Scientist (that’s just over 400 magazines delivered to my door alone), previously .Net Magazine and PC Pro. New Scientist is a weekly periodical and appears in newsagents on a Thursday. Back in 2006 (and for many years) this meant it would arrive on a Thursday in the post. Unfortunately as time went on, it became Friday…and then Saturday. Recently I’d been receiving some issues on the Monday, 4 days after I’d seen it on the newsstand and 3 days before the next issue. This seemed a bit bizarre to me, so decided to switch to the cheaper subscription ‘digital only’ subscription. I read a lot on my iPad, but i’ve always enjoyed the feeling of ‘switching off’ that comes with picking up a real, printed magazine. That said, I’ve found the NewScientist iPad app a vast improvement on earlier attempts at magazines on tablets. Unlike a lot of earlier magazine apps I tried when I first got an iPad in 2011, the NewScientist app is not a scanned-in image of the printed page. That means text is infinitely sharp, and you can select words to look them up (or even copy and paste them). A push notification alerts me when a new issue is available to download, although so far is hasn’t downloaded in the background as iOS NewsStand are apparently able to do. Being mostly text this does mean the downloads are relatively small, so that’s not a big deal. One thing that does strike me as odd, being ‘digital only’, is the concept of an ‘issue’ itself. Does The Verge have ‘issues’, does the BBC News website? Of course not, they’re digital publications. I wonder whether magazines of the future will either. There is, however, something to be said for having a completed body of work that can be enjoyed as a whole, and having it delivered on a regular schedule and to be able to refer to back to an article based on its issue number and page rather than URL. So glad I made the switch. Not sure I’ll be taking my iPad with me to the beach though. Sand and screens have never been a great mix. For that I’ll resort to good old paper.